After a two month hiatus we are back and more consumed by movies than ever. In the first half we cover The Conjuring 2 and why that is a solid franchise, but the spinoff films miss the mark completely. Then is The Shallows worth your time or does sink like the Titanic? On the second half we hit The Nice Guys and pitch what a possible Nun spinoff could be. All that and more on this episode of Rabbit in Red Radio. The Nice Guys: Holland March (Ryan Gosling) is a down-on-his-luck private eye in 1977 Los Angeles. Jackson Healy (Russell Crowe) is a hired enforcer who hurts people for a living. Fate turns them into unlikely partners after a young woman named Amelia (Margaret Qualley) mysteriously disappears. Healy and March soon learn the hard way that some dangerous people are also looking for Amelia. Their investigation takes them to dark places as anyone else who gets involved in the case seems to wind up dead. 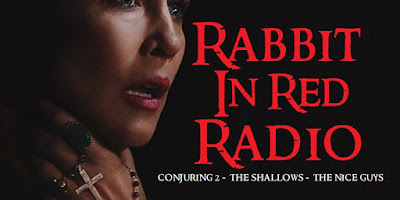 The Conjuring 2: In 1977, paranormal investigators Ed (Patrick Wilson) and Lorraine Warren come out of a self-imposed sabbatical to travel to Enfield, a borough in north London. There, they meet Peggy Hodgson, an overwhelmed single mother of four who tells the couple that something evil is in her home. Ed and Lorraine believe her story when the youngest daughter starts to show signs of demonic possession. As the Warrens try to help the besieged girl, they become the next targets of the malicious spirit. The Shallows: Still reeling from the loss of her mother, medical student Nancy Adams (Blake Lively) travels to a secluded beach for some much-needed solace. Despite the danger of surfing alone, Nancy decides to soak up the sun and hit the waves. Suddenly, a great white shark attacks, forcing her to swim to a giant rock for safety. Left injured and stranded 200 yards from shore, the frightened young woman must fight for her life as the deadly predator circles her in its feeding ground.